Contact Star Realtors, a professional real estate agency that provides service throughout Ontario including Mississauga, Toronto and other locations. 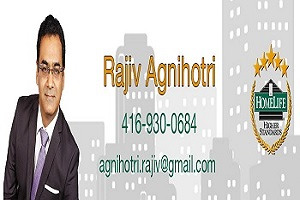 Meet Mr. Rajiv Agnihotri, the real estate agent, who will help you find new homes, condos to buy or rent as per your needs. View updated MLS listings on the company’s web portal where you can search for your new dream home or rental listings. Get in touch with us today to end your house hunt in a short while. Call us at (416-930-0684).